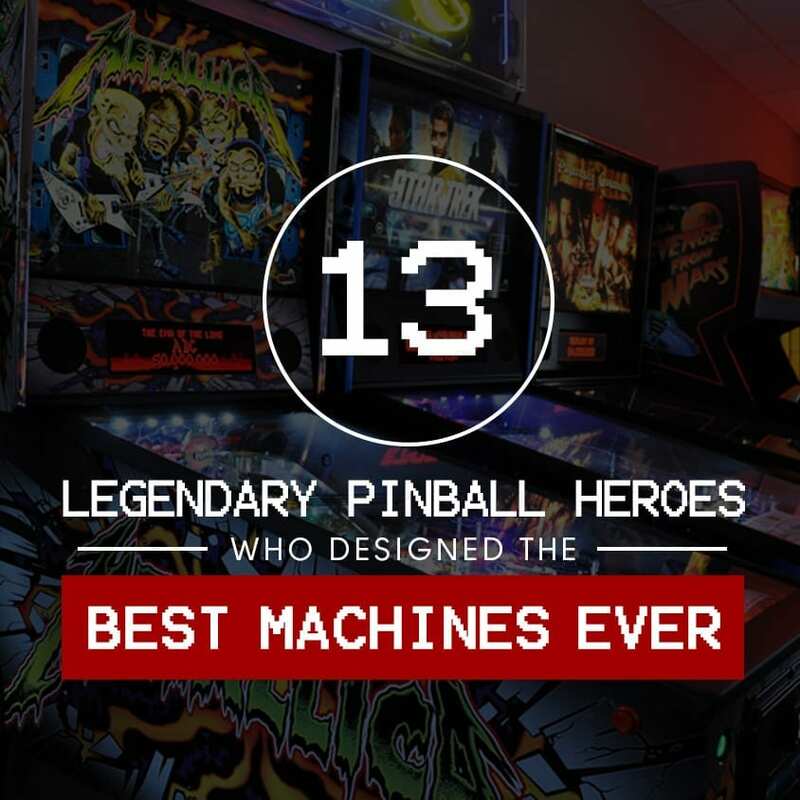 Behind every popular pinball machine is a legendary pinball designer who made a significant contribution to the development of the arcade staple today. Every pinball machine is different. Each play field is completely unique, offering different playing experiences. Some tests your accuracy and reflexes while others are for pure fun and entertainment. Even if you are a non-pinball wizard, you have surely been curious who the geniuses behind such sophisticated creations were. Steve Ritchie is an acclaimed pinball and video game designer. He is the older brother of fellow pinball designer, Mark Ritchie. He is regarded as the “Master of Flow” by pinball aficionados because his games are some of the most fluid and fast in the pinball history. He designed a total of 23 produced individual games. Pat Lawlor may be the most commercially-successful pinball designer of all time. He created some of the best-selling pinball machines of the 1990s with “The Addams Family” (1992) as the most popular. It remains the bestselling solid state pinball machine of all time, with over 20,000 units sold. He has designed a total of 18 produced individual games and his games are considered the most involved and fun the industry has to offer. In 2016, he revealed his latest game “Dialed In!” an original theme released under pinball manufacturer, Jersey Jack Pinball. Brian Eddy started his career in the pinball industry as a software designer. He only started designing pinball machines years later with “The Shadow” (1994) as his first game that was produced. Although his designs are few, each of his games has ranked as some of the best games ever played in pinball history. John Borg is the legendary designer behind many of the most popular tables produced by the Japanese video game company, Data East. He has designed a total of 25 produced individual games and is currently a principal designer at Stern Pinball. John Popadiuk is a noteworthy pinball designer who was in the limelight from the 1970s up until the late 1990s. His machines are easily recognizable for its vivid and fun playfield designs, combining visual effects and technology in each. While Popadiuk has produced a remarkable number of pinball machines, he also has a number of failed attempts at building one. This includes the “Magic Girl,” a limited edition pinball machine that comes with the price of $16,000 each. It was easily the greatest and most expensive pinball machine of all time, if only it had worked. Barry Oursler worked his way in the pinball industry for over 20 years. A former Pinball game designer for Williams Electronics, he produced nearly three dozen titles that collectively sold over 135,000 games over the course of his career. Dennis Nordman is a longtime designer of arcade pinball games boasting of over twenty years of experience in the field. He worked for several arcade game companies including Gottlieb, Bally and William Electronics and Stern. He was quite unfortunate for being laid-off several times, but despite all those, he was able to produce some of the most memorable games. Greg Kmiec is an industry veteran with more than 30 titles to his credit in a career spanning 3 decades. He worked for Bally where he designed numerous titles, a lot of which have become icons of the early solid-state years. He received but declined offers from competitors such as Atari and William Electronics during his stint at Bally. Jim Patla is an industry senior who worked on over 40 tables for Bally in a span of fourteen years. He created memorable games and was inducted into the Pinball Expo Hall of Fame in 2002 and is now retired. Joe Kaminkow was one of the founders of Data East Pinball now known as Stern Pinball. Before helping found the company, Kaminkow worked for Williams where he helped acquire the Space Shuttle license from NASA. He also became the key person to go to for pinball machines licensing. He was inducted into the Pinball Hall of Fame in 2004. Jon Norris started his career by designing his homemade game “Tour de France” in 1984 until he was offered a job in Premier (Gottlieb). In addition to creating popular tables, he also helped develop the rule sets for other’s pinball tables and worked as a company photographer and playtester. He went into a series of misfortunes but eventually got back and has been designing slot machines and redemption games with Joe Kaminkow. Python Anghelo was a designer and artist popular for his work on pinball machines and arcade games. He landed a job in several companies including Disney, Williams and Capcom wherein he designed one game. “Flipper Football” (1994). Before he succumbed to cancer in 2014, he spent his last several years assembling a team to help his most ambitious project, “Pinball Circus” come to life. Did you find this article informative? Share this with your pinball wizard friends today! Follow our blog for more news and stories about Arcade & Pinball.